In September 2015, the US EPA issued a notice of violation to Volkswagen. The European carmaker had, apparently, engineered its turbocharged direct injection diesel engines to turn on the vehicle’s emissions control only during testing. Discrepancies had been discovered by California regulators the year before, many involving European makes and models. The Volkswagen emissions scandal touched off a global regulatory fury. The end result so far has been the Worldwide Harmonised Light Vehicle Test Procedure (WLTP). The name is misleading in the one sense because it hasn’t been adopted worldwide, just Europe. It is a new way to test vehicle emissions, though, longer and more intensive examinations of cars and trucks outside of laboratories on actual roads. These new much stricter standards were phased in last September, applied to some specific new model autos. On September 1, 2018, WLTP began to cover every vehicle intended to be sold in Europe. Some exceptions were made as car companies complained about what would happen; there would be a rush to buy up the old standard models significantly cheaper than the new ones. They were right. In August, there was a massive surge of new vehicle registrations. 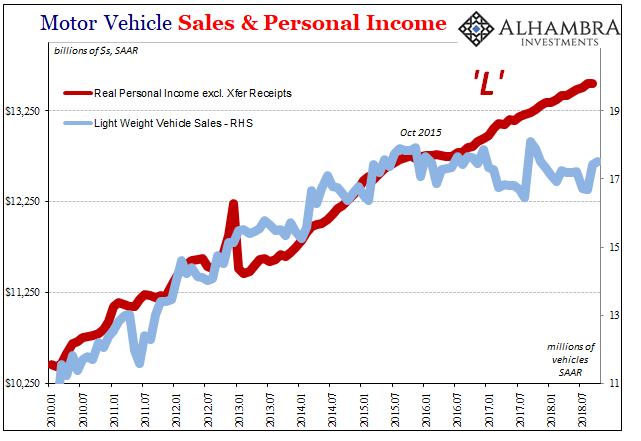 When WLTP took effect, sales plummeted. In Western Europe it had meant a 23% decline during the month of September, according to data from LMC Automotive. Worse, the slump continued in October with new data on vehicle registrations showing a 7.4% decline across all Europe. Putting the recent WLTP distortions to one side, underlying market demand for the region is clearly close to its peak. We’re therefore cautious on the 2019 outlook, given where we are in the market replacement cycle.  Much depends on developments for the region’s economy – which is performing well at present. 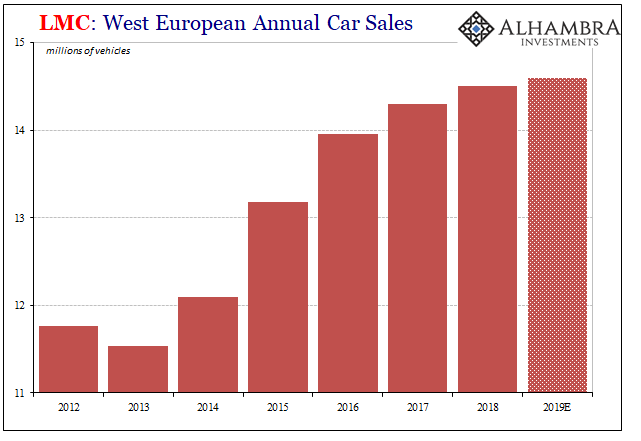 Car sales in Europe have stalled, not in 2018 because of WLTP but for several years now. The latest estimates for 2019 from LMC give Europe a good economy with practically no growth in auto sales. It is a blatant contradiction for more than just the past two months of registration data. 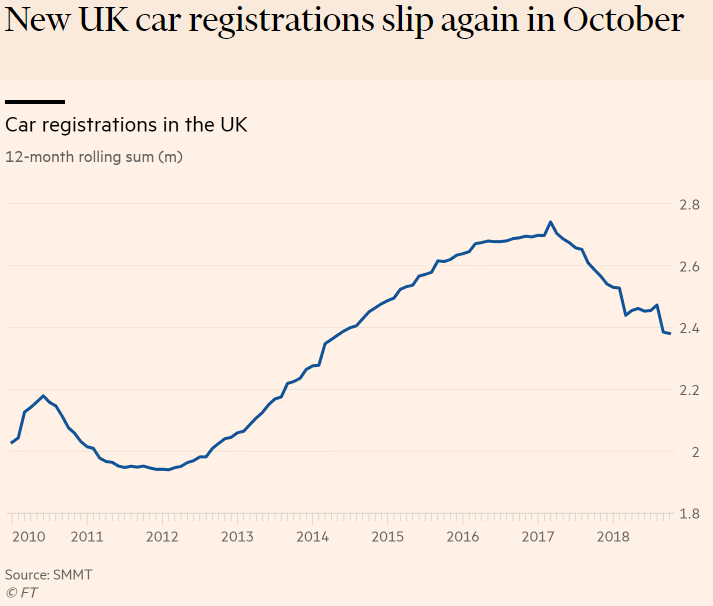 The slowdown in the UK’s car market continued in October, as confusion over diesel and Brexit uncertainty pushed down new vehicle registrations for the seventh consecutive month. Perhaps it’s neither of those. In the United States, the same trend appears only without any reference to it whatsoever. Without a Brexit or WTLP to blame, the very clear multi-year slump in autos simply goes completely unnoticed. It’s as if it isn’t happening because without some noisy distraction it flies directly in the face of the common economic narrative. Don’t put autos on Jay Powell’s radar. The world economy is booming, but no one can sell any cars into it. Consumer preferences change from time to time, but at a glacial pace. There is no other reason why all the world’s auto markets (including China, which will contract in 2018 for the first time in decades) are suffering except economy. Global economy. 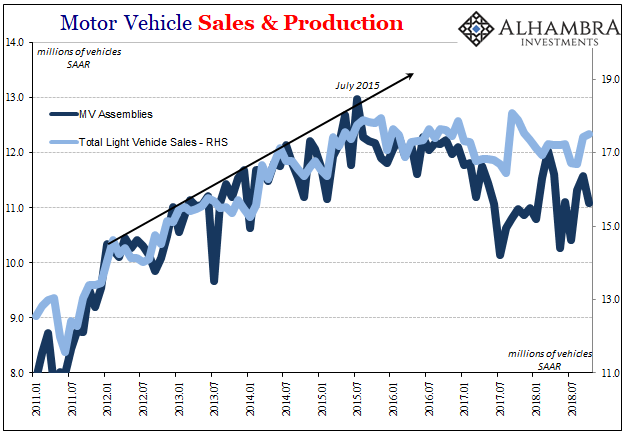 The recession in US auto sales is incredibly easy to explain, it just doesn’t conform to a booming economy, either. Like the inflection in Commercial and Industrial loans, performed at exactly the same time, labor income for American workers slowed and even briefly stopped growing at the last downturn in 2015-16. It has yet to come back. Experiencing that on-the-ground as opposed to the Ivory Tower unemployment rate, consumers would be more cautious in their commitments to big purchases. Housing and autos have wilted as a consequence, not for a mere month or two but for several years in a row. If people aren’t buying more cars, automakers aren’t going to be producing them at a high rate. 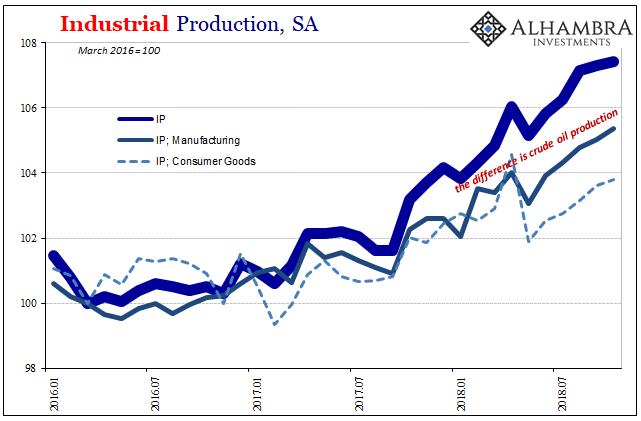 This industry isn’t what it used to be, but it remains an important one nonetheless perhaps most as a bellwether indication for the overall economic condition. 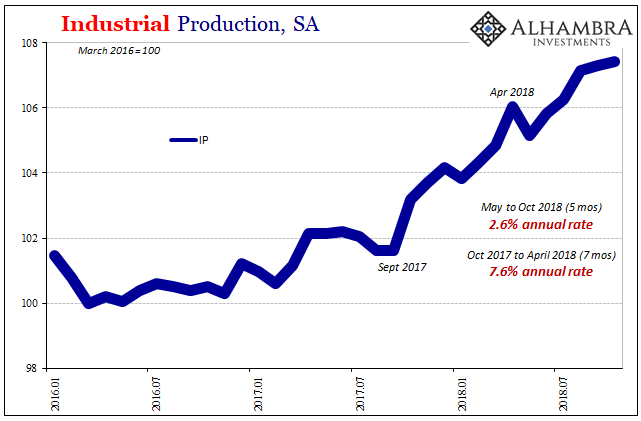 According to the Federal Reserve’s Industrial Production figures, released today, Motor Vehicle Assemblies (MVA), the IP series’ estimate for domestic auto production, were again noticeably weak in October 2018. MVA’s have been stuck at around 11 million (SAAR) for more than a year, with the latest estimate 11.08mm. 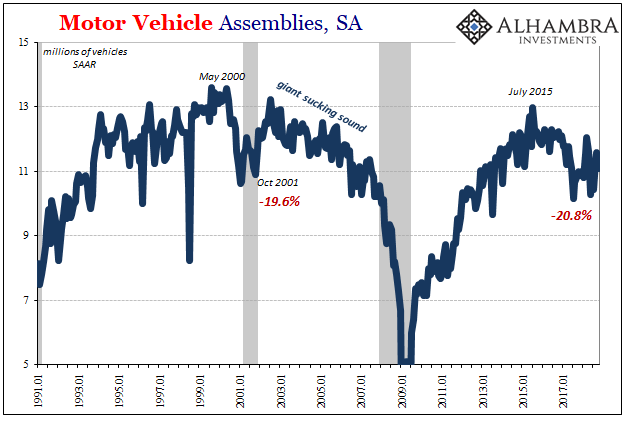 This pace is significantly less than the first half of 2015 when autos were the one bright spot in an otherwise malaise-strewn system. Now there isn’t even that, but this economy since then is booming? What should garner the most focus is this apparent elongating auto recession. The depth is as equal to the decline during the declared dot-com cycle. From May 2000 to October 2001, a period of 17 months, MVA’s contracted by nearly 20%. From July 2015 to July 2017, a period of 24 months, MVA’s declined by just over 20%. The US auto sector never really came back from that recession during the middle 2000’s. The eurodollar expansion had opened the door to Ross Perot’s “giant sucking sound” and the flood of imports was the result. The US economy overall was poor but at least growing “thanks” to an enormous credit-fueled bubble in housing (and others). Since 2015, there isn’t anything like that. The US economy is less than poor, certainly from a labor market perspective incomes first. There is no credit bubble; in places where it might count, there isn’t even credit demand. The auto sector, like too many other sectors, show again there is no economic boom. Because this is a global auto slump, you can easily make the connection. The rest of the IP data confirms a slowing trend; or, data that is moving back toward the prior trend which was only interrupted by the artificial contributions from Harvey and Irma. Overall production had grown by a seemingly robust 5.6% (revised) year-over-year in September on base effects mostly, and that backloaded expansion in the few months following those hurricanes. In October, IP increased only 4.1% year-over-year and is rising at a 2.6% annual rate over the last five months. This is the most charitable view, given out by the mining sector exclusively meaning crude oil production. Without it, US industry is performing with small positive numbers. The rest is in some degree of slump, with autos working out at the lowest position in the class. If the economy was really booming, Americans, Europeans, and Chinese would be buying cars. Lots of them. They aren’t and in the US they haven’t been for many years. 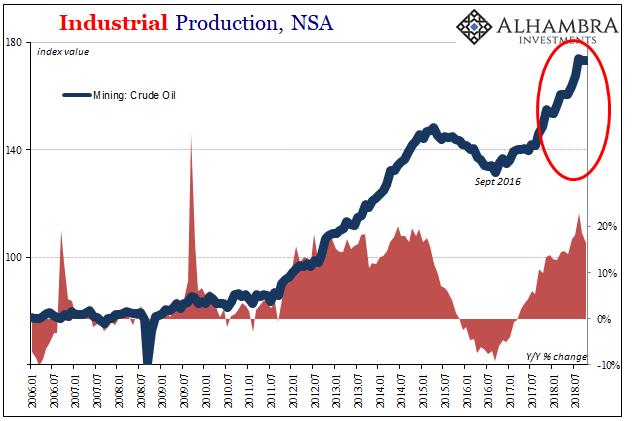 Now with oil prices weak again, what could happen to the only industry actually booming? As sentiment fades from 2017, this isn’t just what’s left this is all there ever was underneath the whole time. Global retrenchment leading to downturn (or worse) is actually pretty easy to understand.